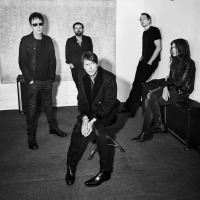 British indie-pop/rock band formed in 1989 and comprised of Brett Anderson - vocals, Mat Osman - bass, Simon Gilbert - drums, Richard Oakes - lead guitar, Neil Codling - keyboards, synthesisers, rhythm guitar. Bernard Butler left in 1994. Their catalogue includes the Mercury Music Prize-nominated debut-album "Suede", "Coming Up" and "Dog Man Star", all containing their familiar anthems such as "Animal Nitrate", "The Wild Ones", "Trash", "Beautiful Ones", "Metal Mickey" and "Lazy". Other albums include their 2013 comeback, "Bloodsports" and 2016's "Night Thoughts".